Sometime within the next two weeks we will be presenting our new menu. My job has been to create a cocktail list to accompany it and after a fair amount of thought, I decided to stay away from a collection of ”house drinks” and simply present a list based on the classics. This does not mean that we do not have anything original to offer you (just come into the bar and ask me! ), but that, when it comes down to it, there is a reason that these drinks have been around for so many years. So, no surprises there…. But, one drink on the list does deserve a special mention, and this is the Sazerac. It claims to be the ”original” cocktail and has it’s origins in New Orleans in 1838, when Antoine Amedie Peychaud, owner of a New Orleans apothecary (the local apoteket was much more exciting in those days! 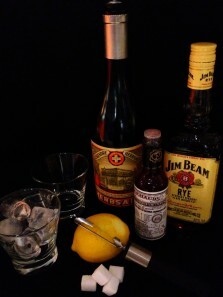 ), started serving a drink based on brandy and his own blend of bitters. Over the following years, the phylloxera epidemic in France caused the recipe change from French brandy to American rye whiskey, and the outlawing of absinthe gave us herbsaint…. There is a certain ritual concerning the preparation of this classic drink, but for that you will have to come and visit me in the bar. Enjoy!